This was our first work day. After a LONG rest last night, we slowly got to work. While not our most productive day, we did accomplish several things, including an organization of the work ahead. 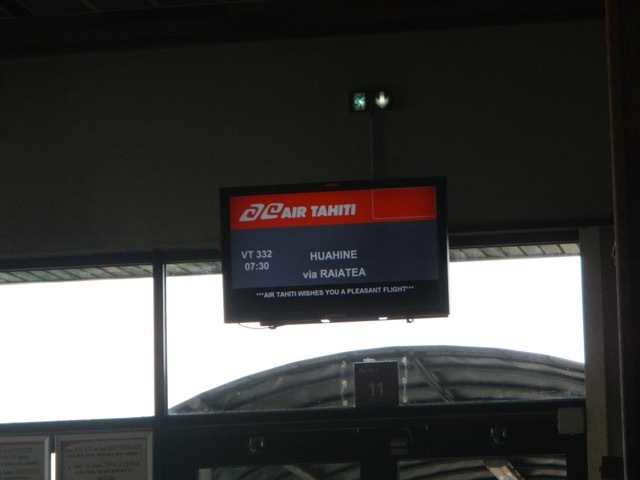 We depart the Fa'a International Airport on the local carrier, Air Tahiti. Air Tahiti Nui, or Big Air Tahiti, is the international carrier. 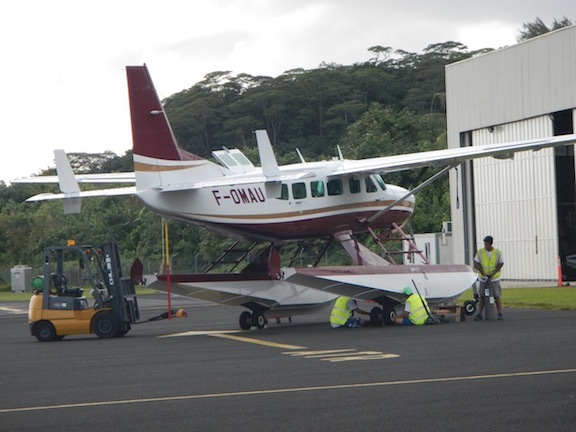 We're joining the flight from Fa'a to Huahine but will deplane in Raiatea. 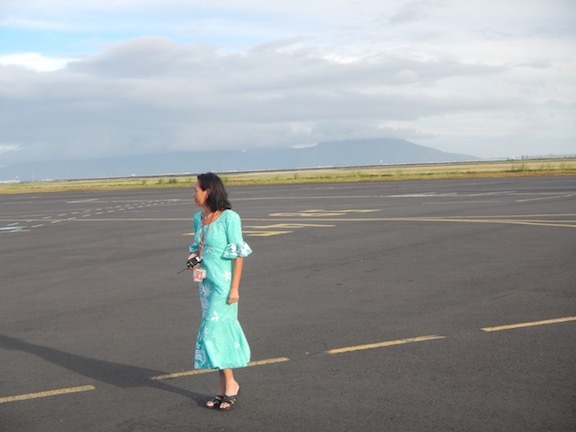 The lovely Air Tahiti flight attendants all wear these simple but colorful dresses and speak Tahitian, French, and English. The island in the background is Moorea, sister island to Tahiti. 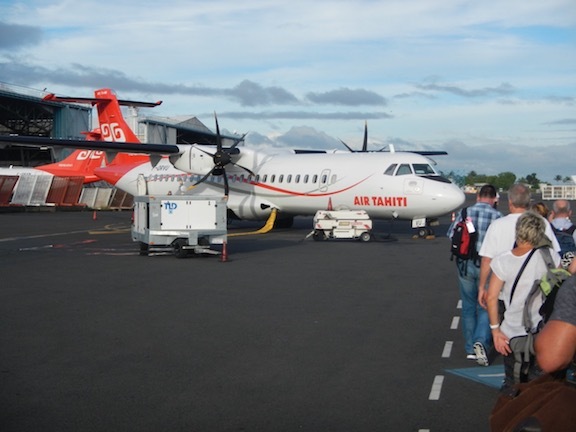 This is a good photo of the turboprops that Air Tahiti uses. We're in the line to board. 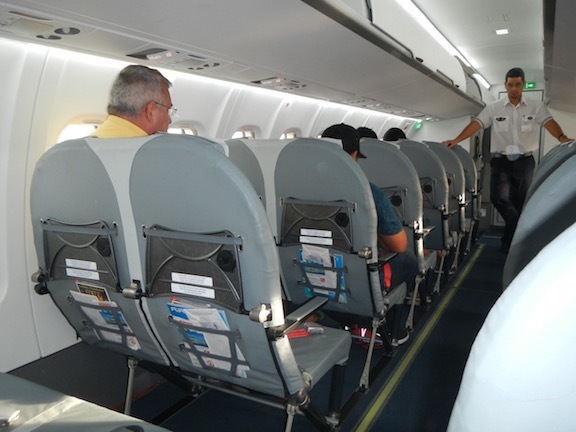 The interior of the planes is a bit Spartan and small, but the flight is short duration. 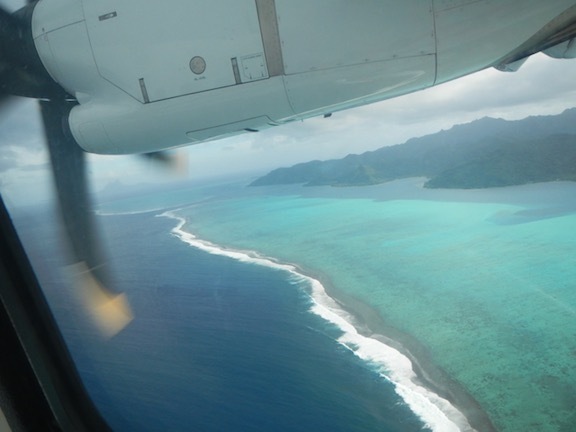 We are descending into Raiatea and are passing over Taha'a, the neighboring island inside the same reef. What beautiful water! Avea Bay, one of my favorite locations, is just out of sight at right. 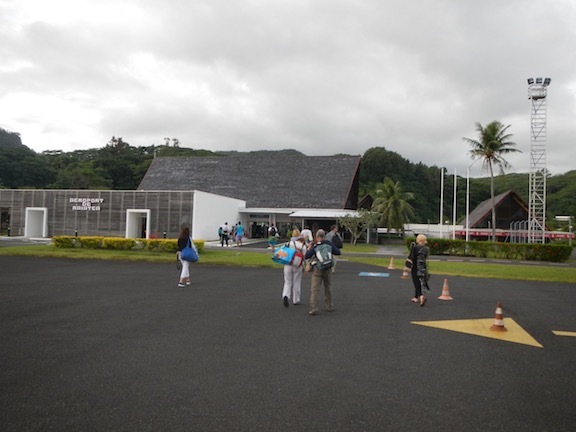 And we're in Raiatea! The tiny airport lies ahead. This is the first float plane that we've seen here, although we're told that they are heavily used. This is a terrible photo, but I wanted to take it before our troubadour departed. 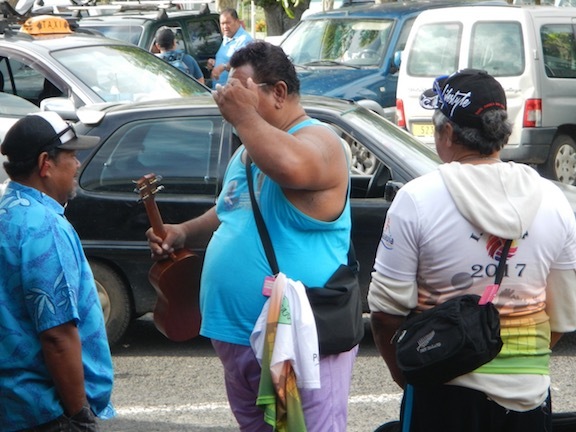 He sang and played his uke in the Fa'a airport and then during the entire trip to Raiatea. He had a beautiful tenor voice and played well. 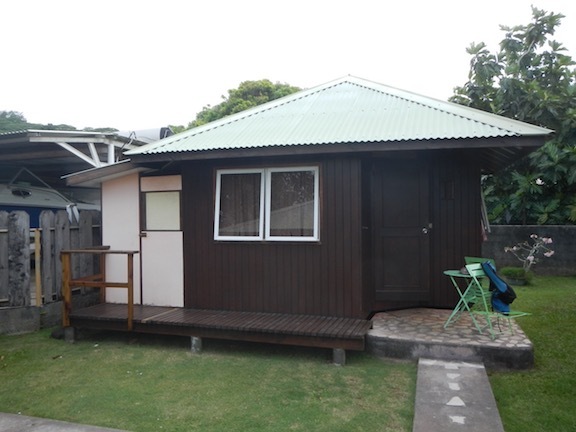 This is Bungalow D, our first time staying here. 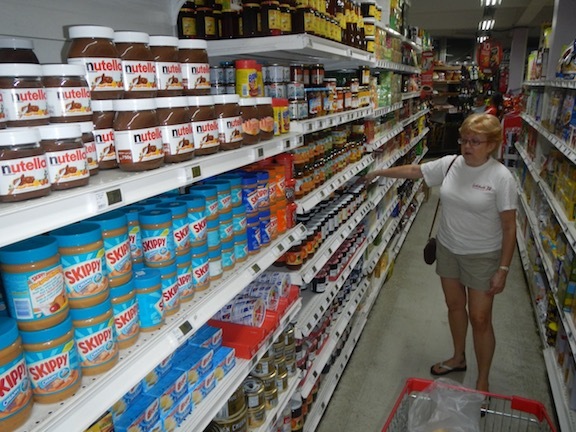 Groceries were our first stop and here Conni's choosing a can of cassoulet for dinner. 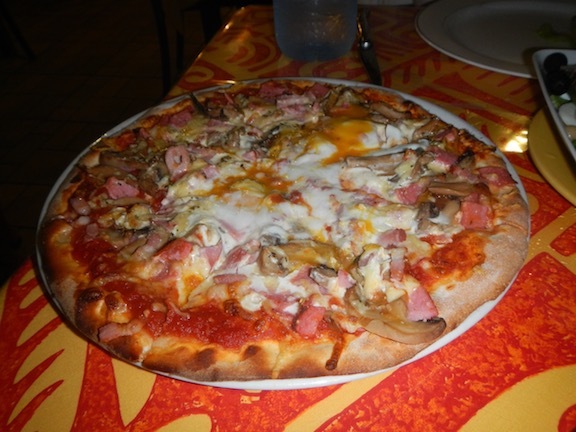 This is the beautiful pizza from Pizza Napoi, 100 m down the road from us. It has a homemade crust that we watched him make. Topping the tomato sauce, ham, olive, mushrooms, and cheese is a now-cooked egg. PLEASE don't tell Conni that I posted this photo! 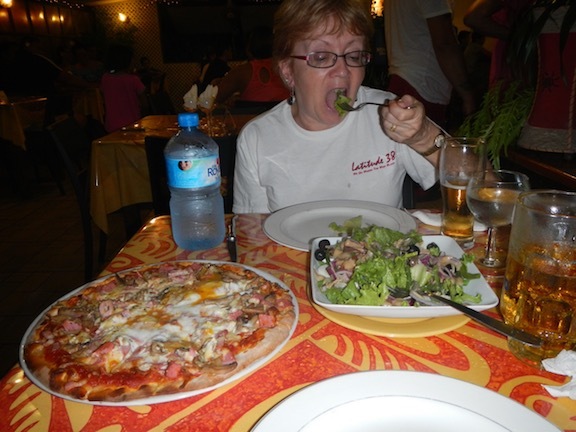 I did not mean to snap her with her mouth open, but it's a great shot of the lovely meal. Salad Nicoise, pizza, and good Hinano on tap, our first. 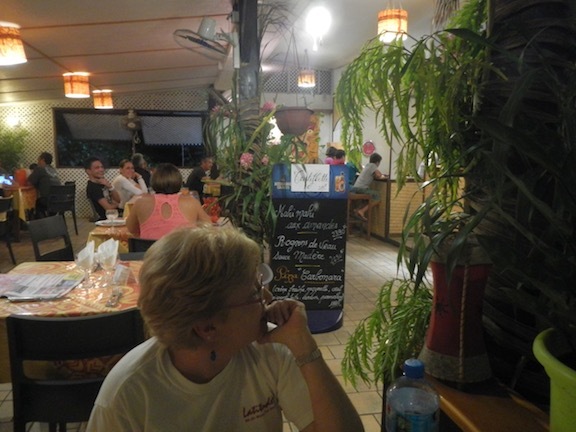 You can see most of the restaurant here, but at the upper right is the pizza bar that overlooks the pizza chef as he produces pizza. He gave the boys there a hunk of dough and a rolling pin to play. Pretty cool! 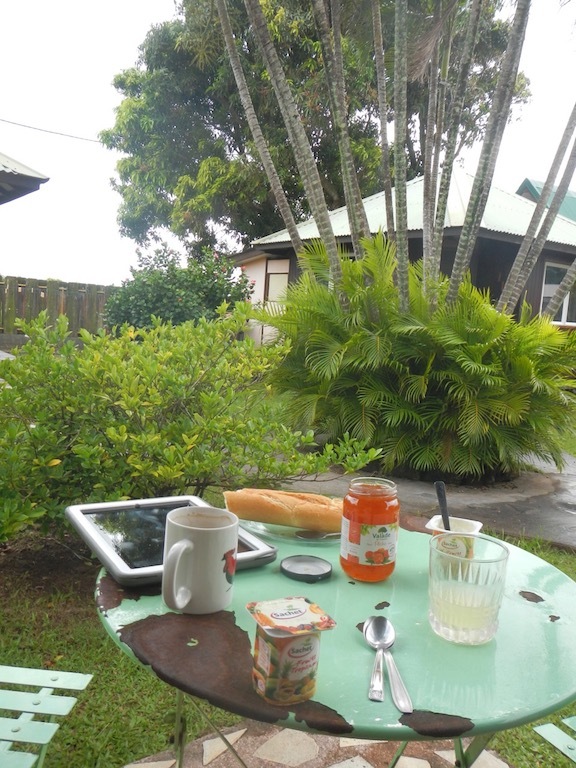 Breakfast consists of yoghurt, baguette, peach marmalade, coffee, and the New York Times online. Wifi at Tiare Nui isn't fast but it's free. 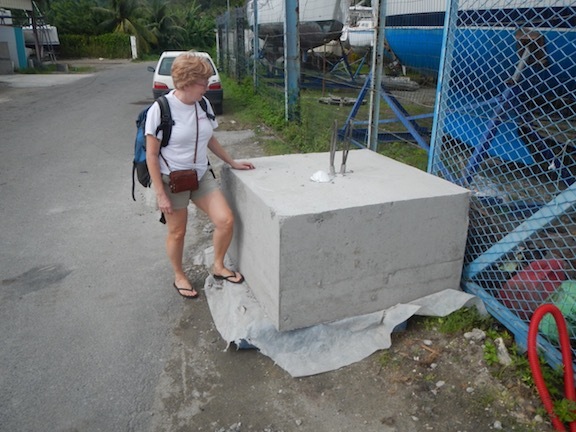 This is mooring anchor, in French the "corps mort" or "deadman". As a longtime climber, I used to bury items in the snow as anchors, and we called them "deadmen". I did not know the etymology of the term. Our first glimpse of Wings, in her cradle behind Pee Wee. This is what 10 months of solar UV will do to new nylon. Holy smokes! 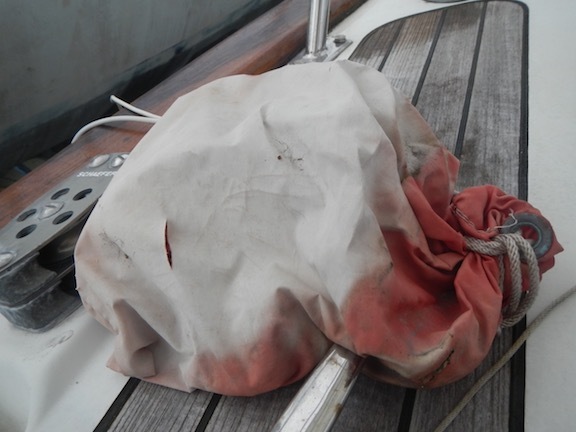 Originally a red nylon bag, it's now a white bag that's literally disintegrating. The bag protects our two external GPS mushrooms. Our prop is getting old! This is our 3-bladed MaxProp, 16-inches in diameter. 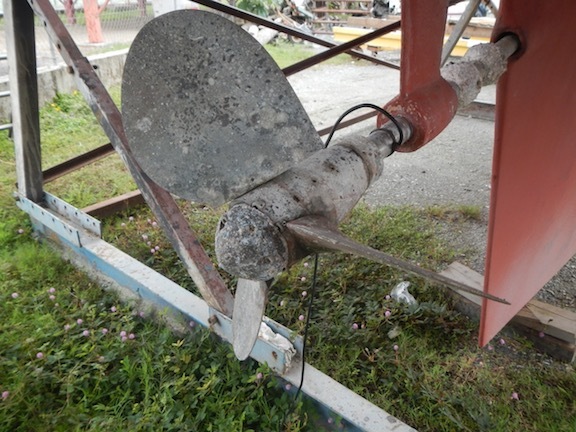 The wire attached to the propeller shaft bleeds off charge that simply cannot be stopped. 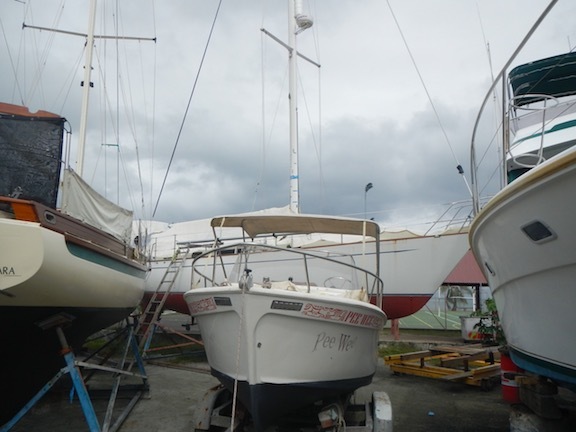 Without the wire, one receives a bit of a shock on simultaneously touching the ladder and boat metal. 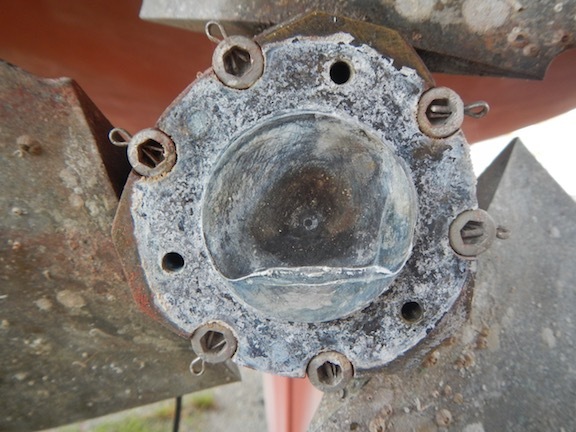 I removed the zinc from the end of the propeller and found this telltale mark of water that had remained in the housing. Sheesh, you can almost see it slosh! Note the Allen screws with small Cotter pins that lock them in place by preventing their rotation. Each must be carefully removed. 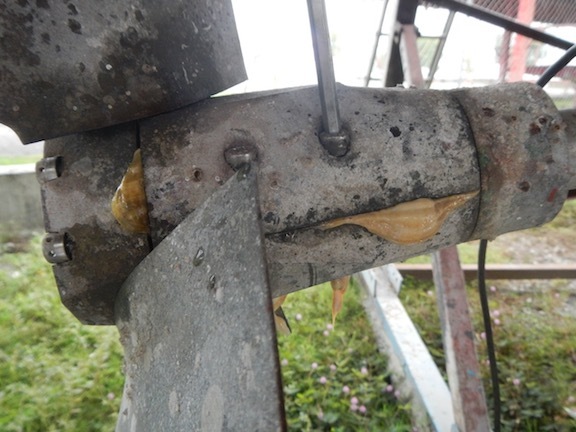 A greased propeller housing is oozing special lubricant. The new lube not only lubricates the internal gearing but displaces any salt water that intruded. The prop "feathers" as the boat sails. The blades will rotate until the prop blade aligns with the water flow and significantly reduces prop drag while underway. Since the prop blades reverse, it also provides exceptionally good propulsion in reverse, as well as it does in moving forward.